This article is about the neutral special move. For characters professional smashers reserve for special matchups, see Alternate character. Villager and Isabelle using Pocket in Ultimate. Pocket (しまう／とり出す, Store Away/Take Out) is the neutral special move of Villager and Isabelle. Pocket allows the user to hold a projectile or item in reserve for later use. The player's pockets as seen in Animal Crossing: New Leaf. In Animal Crossing, one of the biggest goals of the game is collecting items to decorate the player's house or sell for Bells, the game's currency. 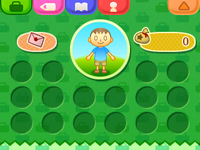 In the games, the player is given an inventory space of 15 slots (16 in New Leaf). Furniture, sea shells, letters, and fruits are among the many items that can be picked up. Items can then be placed anywhere in the world. Planting flowers is a vital part of keeping up the appearance of Animal Crossing towns, which would lead to rewards like golden equipment. Isabelle pocketing Mario's Fireball in Ultimate. When Pocket is activated, the user is given a few frames of intangibility, and will reach out a short distance forwards in an attempt to grab any item or projectile within range, which is then put into storage. Items can be pocketed even in circumstances where they cannot be picked up normally, such as after a Bumper or Spiny Shell has been activated. Using the move again will retrieve the stored object. While projectiles are generally pocketable if they are reflectable, they must also be detached from their user and have their own graphical model (as opposed to being a collection of particle effects), so some projectiles may not be pocketable even though they look like they should be (such as Din's Fire). Retrieved projectiles are automatically thrown with a 1.9x damage multiplier added to them; in addition, they will follow the trajectory they were traveling at prior to being pocketed, such as Pikachu's Thunder traveling straight down and Yoshi's Egg Throw following a parabolic arc. Because pocketed projectiles are nearly twice their original strength, they can easily secure KOs at mid percentages, and even instantly shatter full shields. However, as of version 1.1.3, pocketing and throwing a teammate's projectile deals only 0.5x the original damage, preventing abusive strategies. Retrieved items will appear in the user's hand and can be used as normal. If a pocketed item normally has an immediate effect when picked up, it will activate immediately once retrieved; this can allow the player to store items such as Food, Warp Stars, or Hammers for later use. Collectibles like trophies, CDs and Custom Parts can be pocketed, but they will only count to the player's Vault data if the user retrieves them. Pocketed objects are lost if they are not retrieved after thirty seconds, the user enters a door, or the user is KOed; in the case of collectibles, they will not be added to the player's Vault data. If the user is currently holding an item, instead of reaching forward to grab an object, he will pocket the item he is holding and swap it out with whatever item he previously pocketed. Heavy items like Crates and Barrels cannot be pocketed while held, and retrieving a heavy item from storage will automatically cause the user to throw it. Assist Trophies, Poké Balls, and Sandbag cannot be pocketed in any form. The Smash Ball also cannot be pocketed, though Daybreak and Dragoon pieces can be, which are added to the player's collection as if picked up normally. Pocketed objects are considered to be in-play even if they are not visible, though any timers such as a Bob-omb's fuse are frozen and reset upon retrieval. As a result, special moves that can only create limited numbers of objects can be rendered ineffective if they get pocketed, such as R.O.B. 's Gyro, Wii Fit Trainer's Header, Wario's bike, King K. Rool's crown and Bowser Jr.'s Mechakoopas. Lloid Rocket is an exception to this rule, as pocketing Lloid will immediately allow the Villager who launched it to use the special move again. Pocket is also very effective at Gimping Ness and Lucas as the move can be used to intercept and take their PK Thunder projectile while they're trying to get back onto the stage. Due to the move's temporary intangibility, using the move can give the illusion that a Final Smash has been pocketed; in reality, it simply causes the user to avoid the attack. In Super Smash Bros. Ultimate, the user's grab will pocket items if the net falls on them. Items stored this way can be taken out and used in the same way as items pocketed normally. In addition, pocketed items can now be stored indefinitely, disappearing only when the item is taken out or when the user gets KO'd. They also now appear in a display above the damage meter, making it easier to use but also allowing opponents to know what item is pocketed. "Pocket an item or projectile to use later. Press the button again to take it back out." "You can only pocket items in front of you, but it can hit foes and plant flowers on their heads." "Stash items and projectiles more easily, but they become slightly less effective." Garden: If the opponent touches the vortex on Villager's hand, they will take 10% damage and be inflicted with a flower ailment. This flower falls off almost immediately. There is no damage multiplier for pocketed projectiles, however. Pocket Plus: The vortex by Villager's hand gets bigger, allowing for projectiles to be caught easier. The damage multiplier for projectiles when they are thrown is only 1.3x. Pocket Plus used against Wii Fit Trainer's Header. Villager catching Samus' Charge Shot. ...and throws it where he wishes. Pocket can be used to pick up items. It can then be pulled out for future use. Villager failing to Pocket anything. Villager taking out King K. Rool's pocketed crown in Ultimate. Villager uses Pocket as shown by a Skill Preview in Ultimate. Isabelle uses Pocket as shown by a Skill Preview in Ultimate. This move makes it possible to "carry" a heavy item more efficiently than even Donkey Kong. Making use of the stored item will, however, be a bit slower due to having to pull it out again then throw. In SSB4, Villager can pocket crates from unusually long distances. It also affects custom variants. In previous versions of Ultimate, if Isabelle or Villager pocketed the other's forward or back aerial projectile and traded back and forth by pocketing repeatedly, the game would crash by the third pocket. This only seems to be between Villager and Isabelle, as two Villagers or two Isabelles would not repeat the same result, and no other projectile achieved the same effect. This glitch has been patched out. In Ultimate, any pocketed projectiles (produced by either special moves, or other items like the Ray Gun), character-produced items (such as R.O.B. 's Gyro), and edible objects are instead shown as icons. Some of the icons change depending on the properties of the object that was pocketed. Objects with a fire effect are represented by an orange flame. Objects that push opponents are represented by a blue swirl. Objects with an electric effect are represented by a yellow lightning bolt. Objects with a freeze effect are represented by a light blue chunk of ice. Explosive objects (such as those of Link and his other incarnations) are represented by a black "bomb". Certain objects with the slash effect are represented by a pale crescent. Objects without any special effects are represented by a yellow, jagged "comic-bubble" shape. Objects that recover health are represented as a red apple. Rush Coil, Poison Breath and Eiha/Eigaon all have unique icons, represented as a bitten leaf, three purple bubbles, and dark-red swirl patches, respectively. The bitten leaf is a reference to how furniture is commonly portrayed in Animal Crossing menus. Generic foods are the only items that are represented by icons. 1. ^ Despite being more akin to explosives, includes Grenade Launch, the bullet from the Banana Gun, and missiles (of both suited-Samus counterparts, Snake, and Mii Gunner). Also applies for Red Pikmin, and Simon and Richter's flasks of holy water (despite the latter dealing Aura-based damage). 2. ^ Includes F.L.U.D.D., Water Gun, Mega Man's up air, Hydro Pump, Fire Hydrant's water blobs, and the water from Villager's watering can. 3. ^ Includes Pac-Man's Bell and, surprisingly, Disable. 4. ^ The mortar shell from Snake's up smash, Trick Shot, and Mr. Game & Watch's forward air are also displayed as such. 5. ^ Link's Sword Beam, Final Cutter's shockwave, Razor Leaf, Metal Blade, Leaf Shield, Water Shuriken, Robin's discarded Levin Sword, Elwind, both variants of Blade Beam, Shuriken of Light, and Chakram. 6. ^ Strangely, Shadow Ball and Aura Sphere are under this category, despite having effects (Darkness and Aura, respectively). Burst Grenade also has the same treatment. 7. ^ Includes food items (barring Maxim Tomatoes) and fallen Power Pellets. Interestingly, it also applies to non-edible "food" items (throwable apples, coconuts and durians, and Chansey's throwable eggs. This page was last edited on April 19, 2019, at 07:10.